And, in other news, Roger Federer is through to the quarter-finals. 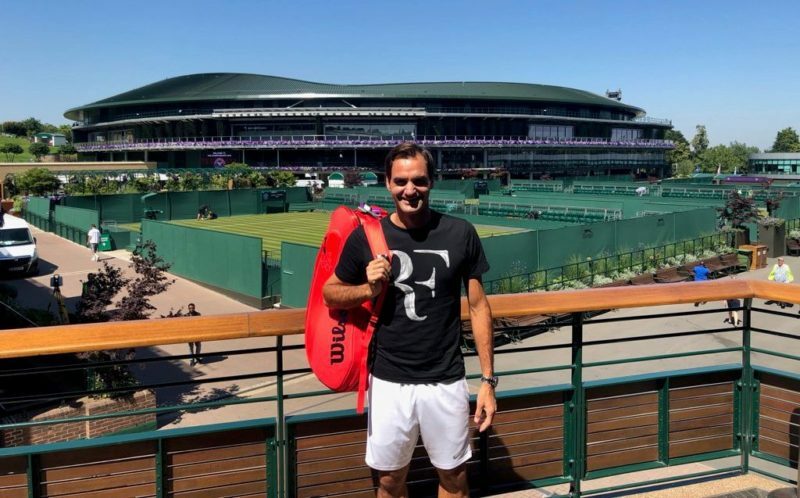 Before an army of Federer fans storm the gates of wimbledon.com, let me explain. The Greatest Of All Time reaches a Wimbledon quarter-final is not going to top the news agenda – he has only failed to get this far once in the past 15 years. Federer not getting to a quarter-final – that is not only news, it is a portent of doom a little like the ravens leaving the Tower of London. Fear not, Fed fans: there was never the merest hint of danger as the defending champion made his way past Adrian Mannarino 6-0, 7-4, 6-4. It meant that Federer has now won 32 consecutive sets at the All England Club. No one has slowed him down, much less threatened to beat him since he started his campaign last year. “I think it was an interesting beginning to the second set,” Federer mused. “It was crucial for him to stay in the match and not give me the lead right away because I had 0-40 in that first game. But nevertheless, he could have won that set and then the match would have been different. Before the match, Mannarino has described Federer as an artist and no one was going to argue with that assessment. But he had also warned that he, too, could paint a bit of a picture on court. He could have his moments. Mmm… Federer as Picasso? Perhaps but maybe not during his cubist phase. To quote the late, great Tony Hancock: “Picasso never did get the hang of a face”. But Picasso in his later days? Maybe. Think of The Dove of Peace – a handful of pen strokes and he creates an iconic image adopted by the peace movement and known the world over. Maybe Mannarino had a point. Certainly Federer can change a match with a couple of racket strokes. He can conjure a point of beauty out of a meat-and-potatoes rally and do it with such effortless ease. All it seems to take is the Mighty One taking a half a pace forward, taking the ball a nano-second earlier, doing something so seemingly simple that it is a wonder no one has thought of it. Ah, but that is the point. The reason why Fed is so is that he not only sees opportunities that others do not but he has the confidence and belief to take them. It is not just a case of being fitter or stronger, getting to the ball earlier; it is knowing what to do when you get there. It is having the unique ability to create those opportunities, reading the opponent and spotting their flaws and weaknesses and then exploiting them with merciless precision. And doing all of this while some big, strapping bloke is trying to knock the cover off the ball and you into the next court. It is no wonder that few can play anywhere near the level of the defending champion. But if Federer is Picasso, what does that make Mannarino? In the first set, he was more a chap with a colouring book and a couple of stubby pencils. Sixteen minutes it took Federer to wrap up the opening set as the Frenchman could only look on and admire. He did have a break point at 5-0 – the first threat to the master’s serve during The Championships until that – but it was not to last. Come the second set, though, Mannarino was making a far better fist of things. At this point he was more your Albert Gleizes or Jean Metzinger, one of your lesser cubists, more your Salon Cubists or Synthetic Cubists (no, honestly, there really were synthetic cubists. Presumably they were like Woody Allen whose lifetime ambition is “to forge in the smithy of my soul the uncreated conscience of my race. And then see if I can have it mass produced in plastic”). Anyway, Mannarino was doing well enough but it was not enough to trouble Federer unduly. There were a few moments when he looked a little grumpy: a tiny opening at 15-30 on the Mannarino serve disappeared thanks to two, rare Federer errors. The first brought a cry of “ayyyyyyyy!” while the second had him growling something that sounded for all the world like “harrumph”, yet I am reliably informed by my Swiss colleagues that there is no word for harrumph in Swiss German. Still, it is always best to check these things. For a few moments, Federer had a bit of nimble footwork to do to fend off another three break points in the third set but once he had dealt with them, it was back to business as usual. He broke for 5-4, served out to love and was through to the quarter-finals in 105 minutes, marginally less time than it took Picasso to knock off a masterpiece.